Hopefully, this inspires those in this life stage (baby boomers and beyond) to do aerobic and strength training. Regular exercise (150 minutes/week) also helps offset the lean muscle mass that we naturally lose each year with age. Alzheimer’s disease(AD) is a neurodegenerative disease responsible for most cases of dementia in elderly population. A lot of trials with drugs are ongoing in order to find the prevention and cure of AD. But recent research have shown life style modification and behavioral changes to be as effective as drugs in the prevention of AD. A study published in the journal of gerontology has shown 6 months of aerobic exercise effective in reducing the symptoms of AD in the elderly population. This study used 6-month cycling intervention to older adults of a selected community with mild-to-moderate AD. The exercise was a standardized, supervised, and individualized, moderate intensity cycling for 15 to 45 min a session (excluding 10-min warm-up and 10-min cool-down activities), 3 times a week for 6 months. Cherries are in season for Michigan. In addition to the benefits listed below, I have learned of a new helpful use for drinking cherry juice….It turns out that cherry juice is a great sleep aid. A friend told me about it and I recently tried it (the organic kind) and it really does work! So, if you want a more natural remedy for helping you get some zzz’s, try some organic cherry juice. Warm weather is here if not the official first day of summer. So, it’s time to think about some of the seasonal fresh fruits and veggies we will be enjoying. 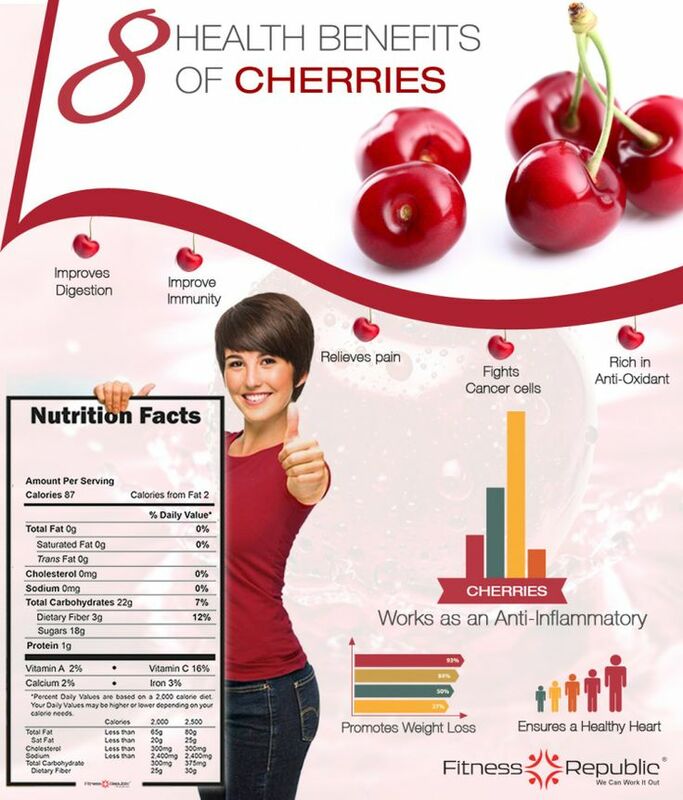 Here is a fun and informative infographic on cherries. Please keep in mind that you can have too much of a good thing. I posted about eating too many cherries. Interesting tid bit is that zucchini has more potassium than a banana. 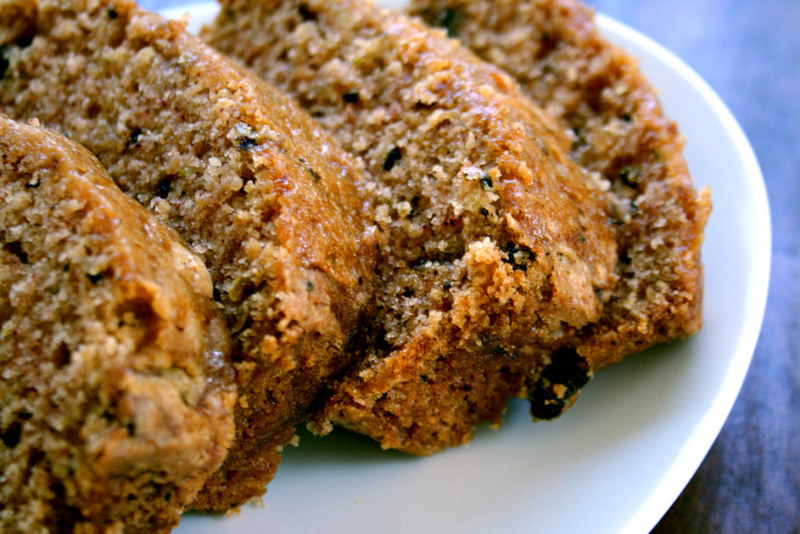 I recently tried someone’s homemade chocolate zucchini bread, what a treat. A zucchini has more potassium than a banana. The word zucchini comes from ‘zucca’ the Italian word for squash. Biggest is NOT best. The most flavorful zucchinis are small- to medium-sized. According to World’s Healthiest Foods Nutrition info, nutrients and vitamins found in zucchini can help prevent cancer and heart disease. The flower of the zucchini plant is also edible. The world’s largest zucchini on record was 69 1/2 inches long, and weighed 65 lbs. Bernard Lavery of Plymouth Devon, UK, grew the humongous veggie. Mild bitterness in zucchini, like that in related species like cucumbers, may be result from environmental factors such as high temperature, low moisture, low soil nutrients, etc. The bitterness is caused by compounds called cucurbitacins. These “super seeds” are showing up everywhere these days. And they offer many nutritional benefits. I added flax seed powder in my smoothie this morning. Leslie Beck wrote in The Globe and Mail …..
Hemp seeds are also an outstanding source of magnesium, a mineral that helps regulate blood pressure and blood sugar. Blend two tablespoons into your smoothie and you’ll get one-quarter of a day’s worth of magnesium (116 mg). Barre Fitness – What’s all the Hype? It seems that more and more studios and gyms are offering the barre fitness classes. This is a ballet-inspired type of a workout. While all barre workouts differ slightly in structure, most methods incorporate exercises done at a ballet barre (you can use the back of a chair at home) combined with elements of ballet, Pilates, and yoga. I recently have taken some “booty barre” class with a friend. This form of the barre fitness incorporates a mix of pilates, yoga, and strength-training moves (utilizing resistance bands and fitness balls). Many of the exercises rely on using one’s own body strength for resistance. The moves challenge your core stability and balance. This workout helps improve your posture, and give you a stronger physique. “You should feel more stronger, flexible, and coordinated with each class.” Though it seems to be more geared toward women, men can benefit from this challenging workout too. Huffington Post featured an article on this a few months ago, to prove the point. The Chicago Tribune recently featured an article on the barre workout, including a bungee ballet version. Not ready to brave the barre class? Self has some at-home techniques to try. 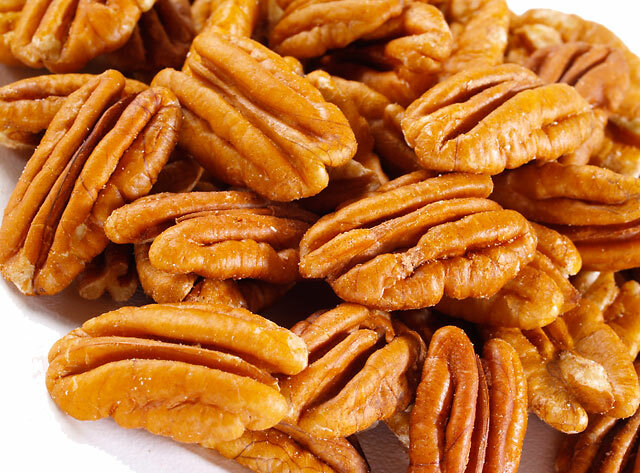 Pecans are a good heart-healthy fat option, as they have both mono and polyunsaturated fats. They provide a source of protein, fiber, and antioxidants. They also contain trace minerals which help with brain function, energy, and the nervous system. According to research from Harvard School of Public Health, consumption of nuts (including pecans) helped with long term weight loss than those who followed a low-fat restricted diet. Nuts provide satisfaction and satiety. Albany, Georgia, which boasts more than 600,000 pecan trees, is the pecan capital of the U.S. Albany hosts the annual National Pecan Festival, which includes a race, parade, pecan-cooking contest, the crowning of the National Pecan Queen and many other activities. The U.S. produces about 80 percent of the world’s pecan crop. This recipe by Cooking Light caught my attention, so I decided to make that today. According to the Almanac, asparagus is in prime season right now. Asparagus is a heart-healthy veggie that is packed with folate (B vitamins) as well as vitamins A, C, and E. I followed this recipe pretty closely, except that I added a bit more olive oil to the cooked noodles and also added about 3 Tbs of basil pesto sauce. Bring 3 quarts water to a boil in a Dutch oven. Heat a large nonstick skillet over medium-high heat. Add oil to pan; swirl to coat. Add asparagus; sauté 3 1/2 minutes. Add garlic; sauté for 1 minute. Add tomatoes; cook for 6 minutes or until tomatoes are tender. Combine cheese, salt, pepper, and egg in a large bowl, stirring with a whisk. Add pasta to boiling water; cook 10 minutes or until al dente. Drain and toss pasta immediately with egg mixture. Add tomato mixture, tossing until sauce thickens. Divide pasta equally among 4 bowls. Sprinkle each serving with 1 tablespoon basil. Serve immediately. To follow this blog and receive updated notifications of new posts by email, please enter your email address here. Academy of Nutrition & Dietetics The world’ s largest organization of food and nutrition professionals. Cook's Thesaurus This is a neat cooking encyclopedia that covers thousands of ingredients and kitchen tools. Environmental Nutrition A newsletter written by nutrition experts dedicated to providing readers up-to-date, accurate information about health and nutrition in clear, concise English. FitFluential FitFluential is a nationwide network of highly influential fitness enthusiasts sharing their journey both online and offline through multiple social media platforms. Kids Eat Right For Parents and Caretakers – scientifically-based health and nutrition information you can trust to help your child grow healthy. Running Bloggers The mission of Running Bloggers is to unite all running bloggers in a fun and supportive community. Together we will grow and support each other in our love for running and blogging. SuperTracker A free, personalized food and fitness journal/tracker to keep you healthy and fit. It also provides menu plans and recipes. U.S. Dept. of Agriculture (USDA) the U.S. federal executive department responsible for developing and executing U.S. federal government policy on farming, agriculture, forestry, and food. USDA Food List You can search by food item, group, or list to find the nutrient information for your food items.